Add chopped coriander leaves, onion and chilli flakes to the dosa batter. The dosa batter should slightly thinner than the ordinary dosa batter. Heat tawa and grease it. Pour a big laddle of batter circle wise (like rawa dosai). Pour one teaspoon of oil around the dosai. When one side is cooked, flip it over and cook other side also. 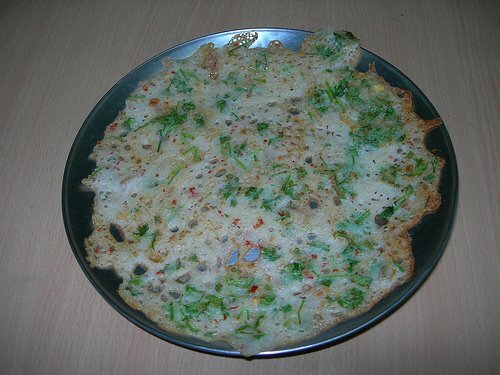 Since the coriander dosa will give slight bitter taste, you can serve it with spicy onion chutney. Note: If you do not have dosa batter, then just mix one cup rice flour, half cup maida and half cup rawa and make a thin batter. Chilli flakes are readily available in stores. Or just put two to three long red chillies in a blender and grind it to a coarse powder.